This week’s selection was a little trickier than usual due to the temporary disbanding of the New Arrivals Island during the Library’s re-carpeting project (don’t worry, New Arrivals will be back soon). Inspired by the colorful palette of wildflowers around campus, I hunted for something to brighten up the blog. It was a toss up between Vogue: The Gown (too hot and sultry), Gems of the World (too cold and aloof), and this one (ah, just right), which also seemed the most practical. If you haven’t dabbled in clay since your Play-Doh days, this guide might inspire you go sink your fingers into a clump of cool, creamy clay — and see what you can make of it. 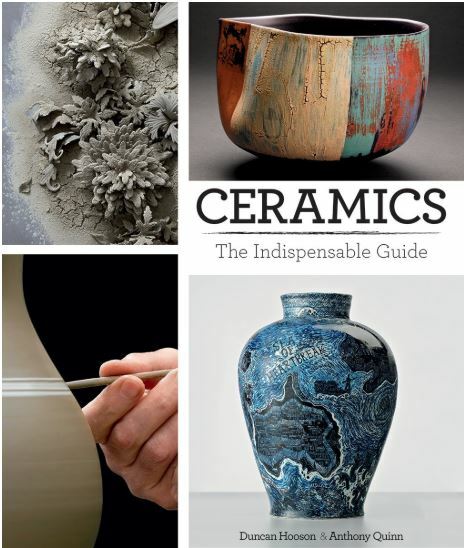 Both authors teach ceramics in London and their book is overflowing with ideas, techniques, glazes, tools, kilns, and firing processes. They have packed a dizzying array of material and hundreds of photographs into these pages and the subtitle of “Indispensable Guide” is well-earned. To find more books on ceramics, you can browse in the Main Collection of books on the third floor of the Library. This entry was posted in new stuff tuesdays and tagged clay, glaze, pottery. Bookmark the permalink.